While many owners would love to spend all their time swimming in their superyacht pool, sipping cocktails from sea-inspired barware and generally enjoying themselves on board their custom superyachts, sadly some time on dry land is often necessary. However, this does not mean to say your land-based residence should be any less luxurious than your yacht. From beautiful waterfront properties to super high-end urban apartments, we’ve rounded up the residences for sale now that are as luxury as your superyacht. 1201 Laurel Way, Beverly Hills Boasting sweeping city and ocean views, wide outdoor spaces and a whole host of amenities, this contemporary estate in Beverly Hills is the perfect home for families who value privacy, luxury and space to spread out. Perched above the city and designed to make the most of its magnificent views over Downtown, Catalina and the coast, 1201 Laurel Way offers six en suite bedrooms, including a vast master suite with walk-in wardrobes and an outdoor deck with spa. Also spread across the 11,200 square foot space are two further bathrooms, a wine cellar, gym, office, home cinema, laundry room, attached garage, dining room and huge airy open plan entertaining spaces enabling seamless indoor/outdoor living. Outside, the property takes advantage of the balmy Californian climate with a putting green, Zen garden, kitchen with bar, dining area, large sunbathing areas and an unusual wraparound infinity pool. 1201 Laurel Way is offered for sale for $38 million with SFJ Group. While many owners would love to spend all their time swimming in their superyacht pool, sipping cocktails from sea-inspired barware and generally enjoying themselves on board their custom superyachts, sadly some time on dry land is often necessary. However, this does not mean to say your land-based residence should be any less luxurious than your yacht. From beautiful waterfront properties to super high-end urban apartments, we’ve rounded up the residences for sale now that are as luxury as your superyacht. Boasting sweeping city and ocean views, wide outdoor spaces and a whole host of amenities, this contemporary estate in Beverly Hills is the perfect home for families who value privacy, luxury and space to spread out. Perched above the city and designed to make the most of its magnificent views over Downtown, Catalina and the coast, 1201 Laurel Way offers six en suite bedrooms, including a vast master suite with walk-in wardrobes and an outdoor deck with spa. Also spread across the 11,200 square foot space are two further bathrooms, a wine cellar, gym, office, home cinema, laundry room, attached garage, dining room and huge airy open plan entertaining spaces enabling seamless indoor/outdoor living. Outside, the property takes advantage of the balmy Californian climate with a putting green, Zen garden, kitchen with bar, dining area, large sunbathing areas and an unusual wraparound infinity pool. 1201 Laurel Way is offered for sale for $38 million with SFJ Group. Designed by noted architects William Hamby and George Nelson for Sherman M. Fairchild, the inventor and businessman most famous for inventing the aerial cameras used on the Apollo space missions, this stunning home occupies prime New York City real estate overlooking Central Park at 17 East 65th Street. The standout feature of this elegant and unusual townhouse is a three-storey great room (pictured) illuminated by an enormous skylight which is accessed from other parts of the house by zig-zagging ramps and primed for displaying art collections and hosting parties. Offering five bedrooms, six bathrooms and two half bathrooms, the stunning master suite boasts floor-to-ceiling windows and a balcony overlooking 65th Street, while the new owner will also be able to make use of an office, dining room, mosaic-tiled kitchen, large living and entertaining areas and a wine cellar. The Sherman M. Fairchild mansion is listed for sale for $35 million with Christie's International Real Estate. Designed by noted architects William Hamby and George Nelson for Sherman M. Fairchild, the inventor and businessman most famous for inventing the aerial cameras used on the Apollo space missions, this stunning home occupies prime New York City real estate overlooking Central Park at 17 East 65th Street. The standout feature of this elegant and unusual townhouse is a three-storey great room (pictured) illuminated by an enormous skylight which is accessed from other parts of the house by zig-zagging ramps and primed for displaying art collections and hosting parties. Offering five bedrooms, six bathrooms and two half bathrooms, the stunning master suite boasts floor-to-ceiling windows and a balcony overlooking 65th Street, while the new owner will also be able to make use of an office, dining room, mosaic-tiled kitchen, large living and entertaining areas and a wine cellar. 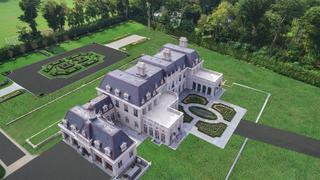 The Sherman M. Fairchild mansion is listed for sale for $35 million with Christie's International Real Estate. The Silicon Valley mansion of tech entrepreneur Scott McNealy, co-founder of Sun Microsystems, has been listed for sale for nearly $100 million. Designed in 2008 by architect Thomas Jakway, the four-storey property is set in over 13 acres of landscaped gardens and boasts close proximity to the headquarters of some of the world's biggest tech firms, including Google, Apple and Facebook. The 20-room home spans 32,000 square feet, including a detached one-bedroom guest house, and offers five further large bedrooms, 7.5 bathrooms and expansive entertaining spaces primed for hosting parties of all sizes. Particular highlights include a pizza room, poker room, nightclub, spa with steam room and sauna, gym, indoor pool, 'safe' room, indoor basketball court, wine cellar, billiard room, garage and media room. Outdoor spaces are just as impressive with a number of terraces and balconies overlooking a large swimming pool, golf practice area with two putting greens and multi-purpose sports arena with an indoor ice rink, tennis courts and locker room. For those planning to host large gatherings there is also parking space for 60 cars. 610 Los Trancos Rd is listed for sale with Rex Real Estate for $96.8 million. The Silicon Valley mansion of tech entrepreneur Scott McNealy, co-founder of Sun Microsystems, has been listed for sale for nearly $100 million. Designed in 2008 by architect Thomas Jakway, the four-storey property is set in over 13 acres of landscaped gardens and boasts close proximity to the headquarters of some of the world's biggest tech firms, including Google, Apple and Facebook. The 20-room home spans 32,000 square feet, including a detached one-bedroom guest house, and offers five further large bedrooms, 7.5 bathrooms and expansive entertaining spaces primed for hosting parties of all sizes. Particular highlights include a pizza room, poker room, nightclub, spa with steam room and sauna, gym, indoor pool, 'safe' room, indoor basketball court, wine cellar, billiard room, garage and media room. Outdoor spaces are just as impressive with a number of terraces and balconies overlooking a large swimming pool, golf practice area with two putting greens and multi-purpose sports arena with an indoor ice rink, tennis courts and locker room. For those planning to host large gatherings there is also parking space for 60 cars. 610 Los Trancos Rd is listed for sale with Rex Real Estate for $96.8 million. A new home with old world charm, Maison des Jardins, located in the Old Brookville area of New York's desirable Long Island, offers the style and elegance of classic 17th Century French architecture combined with the all the modern conveniences and developments of a new build. Inspired by the Château de Versailles and the Château de Vaux le Vicomte, the entrance to the eight acre estate is via a pair of 22-foot high iron gates which open on to a driveway lined with flowering pear trees. Inside, the triplex main residence houses eight ornate bedrooms, ten full bathrooms and five half bathrooms along with opulently designed living spaces, a grand dining room and large kitchen. Staff quarters are also located on site while the landscaped gardens offer a pool and a variety of outbuildings. Maison des Jardins is listed with Knight Frank for $39.8 million. A new home with old world charm, Maison des Jardins, located in the Old Brookville area of New York's desirable Long Island, offers the style and elegance of classic 17th Century French architecture combined with the all the modern conveniences and developments of a new build. Inspired by the Château de Versailles and the Château de Vaux le Vicomte, the entrance to the eight acre estate is via a pair of 22-foot high iron gates which open on to a driveway lined with flowering pear trees. Inside, the triplex main residence houses eight ornate bedrooms, ten full bathrooms and five half bathrooms along with opulently designed living spaces, a grand dining room and large kitchen. Staff quarters are also located on site while the landscaped gardens offer a pool and a variety of outbuildings. 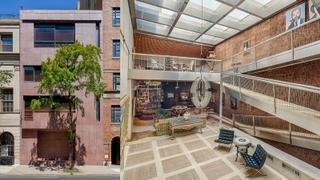 Maison des Jardins is listed with Knight Frank for $39.8 million. The English country estate which belonged to U.S. Ambassador John Hay Whitney and his wife Betsy Cushing Roosevelt Whitney for over 30 years has been listed for sale. Set in 4.1 acres of Surrey countryside on the Wentworth Club golf course, the grand Grade II-listed property sports a style typical of the Great British architectural revival and was designed by Oliver Hill for first owner Katherine Hannah Newton in 1930. Restored and modernised extensively during a four-year project which began in 2007, the main residence features spacious bedrooms and staff quarters as well as a basement cinema, study, wine cellar and large entertaining spaces including a vast living room featuring an impressive four-tonne wall created from Onyx Kilimanjaro. During the improvements a new wing was added to house two further guest bedrooms, a double-height reception room, spa and underground swimming pool while a separate pavilion with subterranean access from the main house offers more guest accommodation, a plant room and a garage. The former U.S. 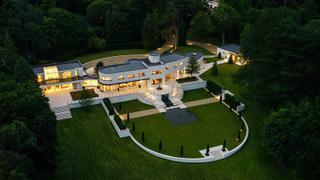 Ambassador's country estate is listed for sale with Savills for £30 million. The English country estate which belonged to U.S. Ambassador John Hay Whitney and his wife Betsy Cushing Roosevelt Whitney for over 30 years has been listed for sale. Set in 4.1 acres of Surrey countryside on the Wentworth Club golf course, the grand Grade II-listed property sports a style typical of the Great British architectural revival and was designed by Oliver Hill for first owner Katherine Hannah Newton in 1930. Restored and modernised extensively during a four-year project which began in 2007, the main residence features spacious bedrooms and staff quarters as well as a basement cinema, study, wine cellar and large entertaining spaces including a vast living room featuring an impressive four-tonne wall created from Onyx Kilimanjaro. During the improvements a new wing was added to house two further guest bedrooms, a double-height reception room, spa and underground swimming pool while a separate pavilion with subterranean access from the main house offers more guest accommodation, a plant room and a garage. The former U.S. Ambassador's country estate is listed for sale with Savills for £30 million. 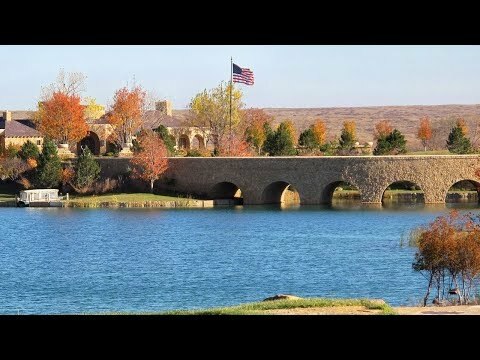 Spanning over 100 square miles of beautiful countryside in Pampa, Texas, Mesa Vista Ranch is the result of over 50 years of development by business magnate T. Boone Pickens and represents 12 different land purchases made since 1971. The main residence, known as the Lodge, comprises more than 25,000 square feet of living space, with an additional 10,000 square feet of terraces and patios, and features a huge master bedroom with en suite bathroom, dining room, great room, two storey library, conference room, 30-seat theatre, wine cellar, office, commercial kitchen and large basement. A nearby Family House offers a further five bedrooms, five bathrooms, living area, kitchen and living room. Slightly further away the 11,500 square foot Lake House boasts three bedrooms, five and half bathrooms, wine cellar, tasting room, dining room, kitchen, office, gym and utility room. Further outhouses include a pub with two game rooms, bathroom, kitchenette, gym and two sleeping areas, a gun room with lounge, bathroom and kitchenette, gatehouse with three bedrooms, three bathrooms, living area, utility room, garage and deck, 11,000 square foot dog kennel with 40 chainlink dog pens, offices, meat processing centre, vets lab, overhead crane and bathroom, a chapel and a children's play house. Bordered by the Canadian River for nearly 25 miles, the ranch represents an oasis in the middle of the Texas Panhandle thanks to a network of man-made streams and lakes added by Boone Pickens to encourage wildlife to thrive on the property. Nestled within the manicured gardens are a number of water features and tree-lined parks as well as an FAA-approved private airport with a large hangar complete with lounge and a two bedroom pilot's apartment. A working ranch, Mesa Vista is offered for sale complete with all furnishings, farming equipment, vehicles and bird dogs while Boone Pickett's vast art collection and livestock are available to purchase separately. Mesa Vista is listed for sale with Hall and Hall and Chas S. Middleton for $250 million. Spanning over 100 square miles of beautiful countryside in Pampa, Texas, Mesa Vista Ranch is the result of over 50 years of development by business magnate T. Boone Pickens and represents 12 different land purchases made since 1971. The main residence, known as the Lodge, comprises more than 25,000 square feet of living space, with an additional 10,000 square feet of terraces and patios, and features a huge master bedroom with en suite bathroom, dining room, great room, two storey library, conference room, 30-seat theatre, wine cellar, office, commercial kitchen and large basement. A nearby Family House offers a further five bedrooms, five bathrooms, living area, kitchen and living room. Slightly further away the 11,500 square foot Lake House boasts three bedrooms, five and half bathrooms, wine cellar, tasting room, dining room, kitchen, office, gym and utility room. Further outhouses include a pub with two game rooms, bathroom, kitchenette, gym and two sleeping areas, a gun room with lounge, bathroom and kitchenette, gatehouse with three bedrooms, three bathrooms, living area, utility room, garage and deck, 11,000 square foot dog kennel with 40 chainlink dog pens, offices, meat processing centre, vets lab, overhead crane and bathroom, a chapel and a children's play house. Bordered by the Canadian River for nearly 25 miles, the ranch represents an oasis in the middle of the Texas Panhandle thanks to a network of man-made streams and lakes added by Boone Pickens to encourage wildlife to thrive on the property. Nestled within the manicured gardens are a number of water features and tree-lined parks as well as an FAA-approved private airport with a large hangar complete with lounge and a two bedroom pilot's apartment. A working ranch, Mesa Vista is offered for sale complete with all furnishings, farming equipment, vehicles and bird dogs while Boone Pickett's vast art collection and livestock are available to purchase separately. Mesa Vista is listed for sale with Hall and Hall and Chas S. Middleton for $250 million. If you're a fan of Gilded Age period architecture and are looking for a family home large enough to host lavish parties then 235 Middle Neck Rd, the property believed to have inspired F. Scott Fitzgerald's The Great Gatsby, couldn't be more perfect. 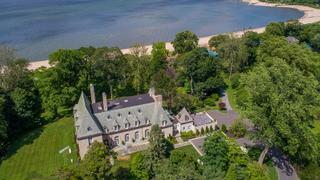 The palatial 13-bedroom residence was built in 1926 and stands on 5.3 acres of land including 391 feet of sandy waterfront in the highly desirable Sands Point area of Long Island. In total the property boats 29 rooms, including nine bathrooms, a large living room, formal dining room, a wine cellar, two porches, gym, library, office, playroom, walk-up attic and attached garage. Outdoors there is also a large deck, tennis courts and lush landscaped gardens sweeping down to the ocean. As well as its spacious interiors, a huge draw of this property is its numerous original period features including nine fireplaces, large windows providing plenty of natural light and Colonial style architecture with high ceilings and dramatic lines. 235 Middle Neck Road is listed for sale for $13,888,000 with Sotheby's International Realty. If you're a fan of Gilded Age period architecture and are looking for a family home large enough to host lavish parties then 235 Middle Neck Rd, the property believed to have inspired F. Scott Fitzgerald's The Great Gatsby, couldn't be more perfect. The palatial 13-bedroom residence was built in 1926 and stands on 5.3 acres of land including 391 feet of sandy waterfront in the highly desirable Sands Point area of Long Island. In total the property boats 29 rooms, including nine bathrooms, a large living room, formal dining room, a wine cellar, two porches, gym, library, office, playroom, walk-up attic and attached garage. Outdoors there is also a large deck, tennis courts and lush landscaped gardens sweeping down to the ocean. As well as its spacious interiors, a huge draw of this property is its numerous original period features including nine fireplaces, large windows providing plenty of natural light and Colonial style architecture with high ceilings and dramatic lines. 235 Middle Neck Road is listed for sale for $13,888,000 with Sotheby's International Realty. Built by property developer Bruce Makowsky as a direct response to the lack of properties offering superyacht levels of luxury on land, at $250 million, 924 Bel Air Drive was briefly the most expensive property to ever be listed for sale in America. Situated within the 'platinum triangle' of Bel Air, Beverly Hills and Holmby Hills, there are unrivalled views of both the Malibu coastline and San Gabriel mountains from every space of the striking 38,000 square foot mansion. The property comes furnished and Makowsky says he has travelled the world looking for the finest custom-made furniture, fabrics and art to fill the 12 bedroom, 21 bathroom home. Inside there are three kitchens, a bowling alley, 40-seat cinema, dedicated candy room (complete with $200,000 worth of sweets), massage room, gym, wine cellar filled with Champagne, bar and vast entertaining spaces decorated with over 130 fine artworks. The open-sided basement comes with a $30 million car collection of vintage classics and 21st century supercars while outside is an infinity pool with swim-up bar, helipad with helicopter and a number of outdoor dining and entertaining spaces with screens. Also included in the price are the salaries of seven live-in members of staff for two years. 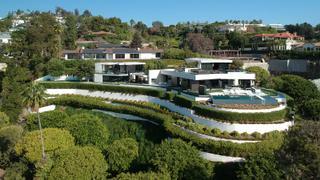 924 Bel Air is listed for sale for $250 million with BAM Luxury Development. Built by property developer Bruce Makowsky as a direct response to the lack of properties offering superyacht levels of luxury on land, at $250 million, 924 Bel Air Drive was briefly the most expensive property to ever be listed for sale in America. Situated within the 'platinum triangle' of Bel Air, Beverly Hills and Holmby Hills, there are unrivalled views of both the Malibu coastline and San Gabriel mountains from every space of the striking 38,000 square foot mansion. The property comes furnished and Makowsky says he has travelled the world looking for the finest custom-made furniture, fabrics and art to fill the 12 bedroom, 21 bathroom home. Inside there are three kitchens, a bowling alley, 40-seat cinema, dedicated candy room (complete with $200,000 worth of sweets), massage room, gym, wine cellar filled with Champagne, bar and vast entertaining spaces decorated with over 130 fine artworks. The open-sided basement comes with a $30 million car collection of vintage classics and 21st century supercars while outside is an infinity pool with swim-up bar, helipad with helicopter and a number of outdoor dining and entertaining spaces with screens. Also included in the price are the salaries of seven live-in members of staff for two years. 924 Bel Air is listed for sale for $250 million with BAM Luxury Development. Make history by buying the world’s most expensive home - Villa Les Cèdres in Saint-Jean-Cap-Ferrat - which has an estimated price tag of $410 million. So what do you get for your money? This expansive property was built in 1830 and was once owned by King Leopold II of Belgium, as well as hosting Winston Churchill, Charlie Chaplin, Elizabeth Taylor and Prince Rainier III of Monaco in its ten bedrooms. The main house also features a ballroom, winter garden, chapel and concierge while the 35-acre estate also houses a 50 metre swimming pool, stables for 30 horses, 20 greenhouses and stunning landscaped gardens. Villa Les Cèdres is currently owned by the Campari Group and has an estimated value of $410 million. Make history by buying the world’s most expensive home - Villa Les Cèdres in Saint-Jean-Cap-Ferrat - which has an estimated price tag of $410 million. So what do you get for your money? This expansive property was built in 1830 and was once owned by King Leopold II of Belgium, as well as hosting Winston Churchill, Charlie Chaplin, Elizabeth Taylor and Prince Rainier III of Monaco in its ten bedrooms. The main house also features a ballroom, winter garden, chapel and concierge while the 35-acre estate also houses a 50 metre swimming pool, stables for 30 horses, 20 greenhouses and stunning landscaped gardens. 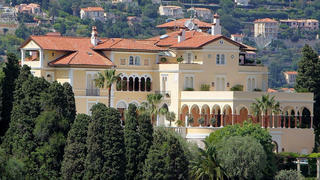 Villa Les Cèdres is currently owned by the Campari Group and has an estimated value of $410 million. One of the most famous and architecturally significant houses in the world, the iconic “Bubble Palace” in Théoule-sur-Mer has been listed for sale by its current owner fashion designer Pierre Cardin. Built in 1979 to a design by Antti Lovag, each of the house’s ten suites has been decorated by a different contemporary artist while the reception rooms and 500-seat outdoor auditorium offer panoramic views over the bay of Cannes. The Bubble Palace has attracted a number of celebrity guests, including Marion Cotillard and Pierce Brosnan, as well as providing a dramatic backdrop for a recent Dior Cruise fashion show (pictured). The Bubble Palace is for sale with Christie’s International Real Estate with an estimated price of £300 million. One of the most famous and architecturally significant houses in the world, the iconic “Bubble Palace” in Théoule-sur-Mer has been listed for sale by its current owner fashion designer Pierre Cardin. Built in 1979 to a design by Antti Lovag, each of the house’s ten suites has been decorated by a different contemporary artist while the reception rooms and 500-seat outdoor auditorium offer panoramic views over the bay of Cannes. The Bubble Palace has attracted a number of celebrity guests, including Marion Cotillard and Pierce Brosnan, as well as providing a dramatic backdrop for a recent Dior Cruise fashion show (pictured). The Bubble Palace is for sale with Christie’s International Real Estate with an estimated price of £300 million.